One of my favorite experiences when grilling or firing up the barbecue is the inevitable inquiry about whether I make my own rubs from scratch. And typically when I say yes, it seems to evoke a sense of wonder, as if the idea of making a homemade rub is steeped in ancient secrets. Many owners of barbecue restaurants or competitive teams are very secretive about what goes into their ingredients. Some have taken a lot of time to develop exactly what flavor they are trying to express in their food. I have a lot of respect for the passion and attention that goes into such a process. That led me to explore my own expression of flavor and to try to focus on some fundamentals that come from creating my own rubs. So, unlike those competition barbecue heads, when someone asks me today about a recommended rub, I freely and gladly provide him or her with my recipe, explaining of the basics of creating it to help them build their own flavor profile. Styles of barbecue vary, and like everyone’s palate, can be incredibly subjective. 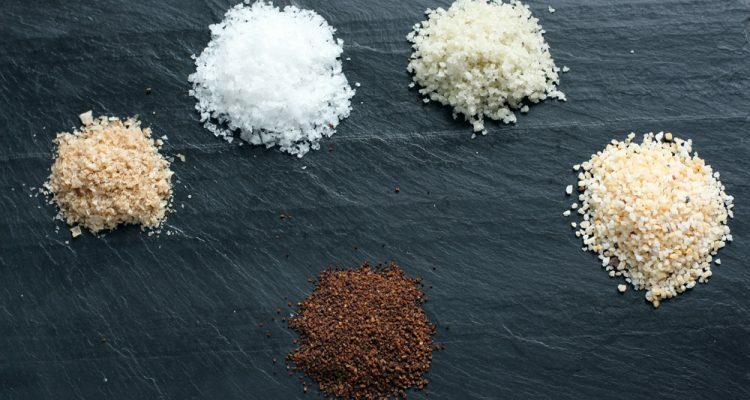 Understanding what can be created through the combination of salt and other ingredients can get anyone to a comfort zone in creating a homemade rub in your own personal style. What is a rub? Technically it’s a combination of dry ingredients for enhancing the flavor of your item being cooked – in this case, barbecue. Savory starts with salt. I’m not referring to ordinary iodized table salt. There is a diverse world of salts from around the world providing a range of flavor profiles, from delicate and refined to limy or chalky, or with sulfuric and eggy characteristics. Look to Himalayan salts or sel gris for a briny earthen flavor; these go great with beef and pork. For fish, a delicate flaky sea salt like Maldon or kosher salt allows the flavor of the fish to shine. You can even find salts that are smoked of all varieties for added smokiness. For additional flavors that complement just look in a spice shop (Penzey’s is a good mail-order outfit) and you will quickly realize an infinite number of options. 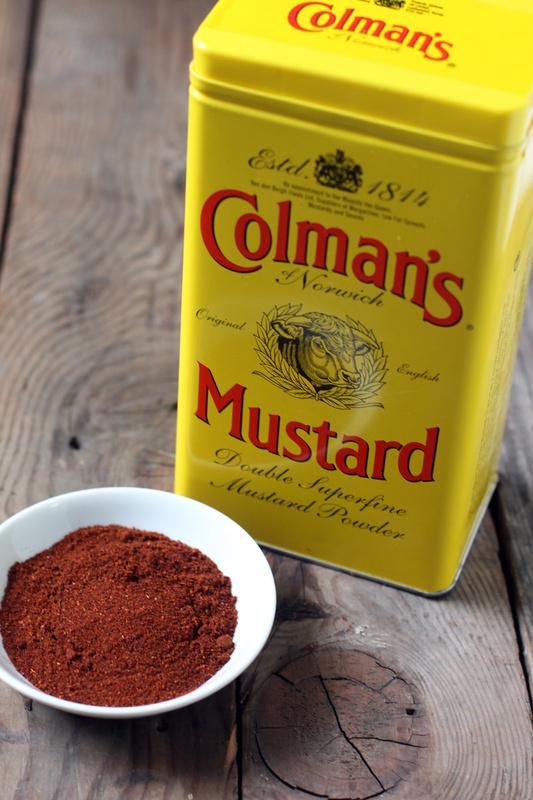 One of my favorite savory spices is dry mustard. On its own it can seem flat and almost chalk-like. But when added to your rub and cooked for hours, I find that dry mustard helps contribute a savory flavor and richness. Chili powder is another great addition evoking that sweet and smoky balance (Chili powder is simply a blend of dried chilies, cumin and a few other spices). Paprika adds color and a hint of smokiness. Cumin on its own will lend a fragrant aromatic as it cooks away. There are so many other spices like celery salt, onion powder, ancho powder and a variety of others. I recommend starting simple and adding more flavor as you experiment. This is where we can get a variety of opinions, especially if you add sugar to beef. Adding sugar will offset the savory flavors and it also adds to the development of the crisp caramelized crust known as bark. There are a host of options here, but start with your basic white cane sugar. It will caramelize well and is not overpowering. Want to add a little more richness? Go with light or dark brown sugar. Turbanado sugar is always exciting, with large crystals and a rich, distinct flavor. There is such a range of tolerance for heat but the addition will contribute depth to your barbecue. Consider freshly cracked black pepper at a coarse setting for heat that is restrained yet pleasant and cooking for a group that you don’t know. The coarse setting complements the coarse style salts. Cayenne pepper is another base spice that will really focus heat in small doses. Red chili pepper flakes are fine too but the texture can be a bit too flaky and unpleasant on the finished product. I lean towards cayenne. For added smokiness and a southwestern edge I always bring the chipotle seasoning in place of the cayenne. Want a bite but not something that makes you cringe? Try garlic powder. Now we get down to combining the ingredients to make up your secret rub. I like to keep it simple. For me it boils down to balance and a ratio. When I try the rub, I don’t want any one characteristic standing out. Now we’ll start with a basic rub for pork and chicken, one to one. One part sugar (I lean toward dark brown) to one part everything else. What does that mean? It means that you add to a bowl one cup of sweet, and then the remaining cup is a combination of heat and savory. The ratio never changes for me. I’ll fill up one cup of sugar and then use the next cup and blend all the other spices. 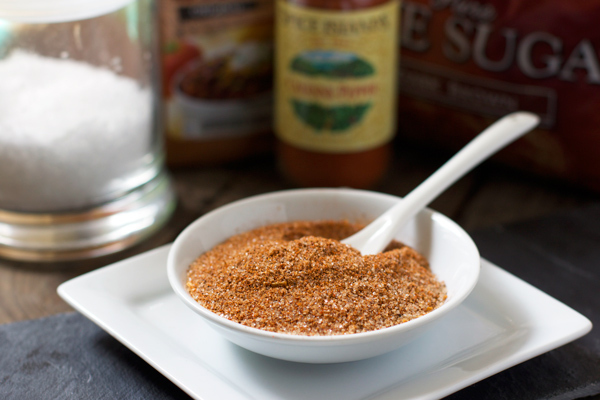 Two cups of rub will easily take care of a few large cuts of meat. How about beef? I’ll typically skip the sweet and just add equal parts savory and heat. Store in an airtight container for up to one year. When applying a rub, I follow a few key steps. The rub needs to stay on and it needs to do its job in getting flavor on and in the meat. I always trim, rinse, and pat dry a cold piece of meat. Then I add some kind of slather. Slather can simply be some liquid that will adhere to the meat and act as a glue for the rub. Most commonly for pork I use Dijon mustard and extra virgin olive oil for beef. I apply the rub immediately after the slather. The rub should be on the meat for a few hours. I really don’t go any more than overnight. The key (due to salt being a key part of the rub, especially coarse salt) is to avoid rubbing it on right before you are about to cook. With the ratio basics of sweet, heat, and savory guiding your do-it-yourself rub technique you can adjust your proportions based upon the flavor you are seeking for your barbecue dish. Always write it down and then take notes when you are eating the food – what worked, what didn’t, what your friends told you – and then tweak the recipe to suit your preference. You can see the limitless way this works. There are no correct answers, except that which your palate enjoys. Sure, you can go buy the secret rub that competitors make, but where is the fun in that? Next time your guests ask where you bought the rub and you shrug and say, “That? Oh, I made that myself.” It puts you in a whole new category of backyard badass, and you’ll shake your head with how easy it really is.